Regulator uses its 30th birthday as an excuse to make its lineup, including the 25, better. Regulator Marine started building boats in 1988, seeking to perfect the deep-V center console fishing boat. The ensuing 30 years have seen the builder continue to tweak, modify and enhance its original design, and now Regulator is celebrating three decades of the pursuit of perfection — and fish. The Regulator 25 is and has been a midsize fishing monster — illuminated and insulated fishboxes under both bow seats and in the deck of the bow, a livewell/fishbox at the transom, tackle options in the leaning post, insulated cooler under the console seat, seatback and T-top rocket launchers, outriggers, in-gunwale rod holders, fresh- and saltwater washdowns — and for its 30th anniversary Regulator added more options. 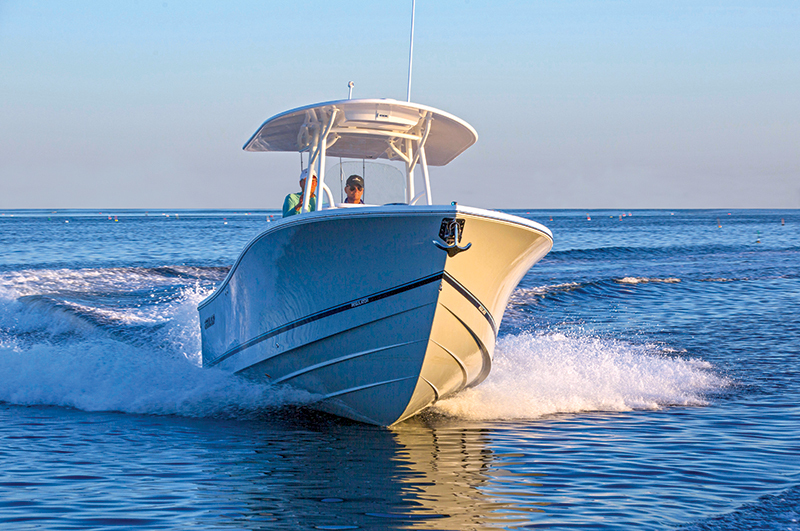 Twin 200 hp Yamaha outboards are standard, but buyers can now opt for twin F250s and SeaStar Solutions’ Optimus electronic power steering and tilt helm. 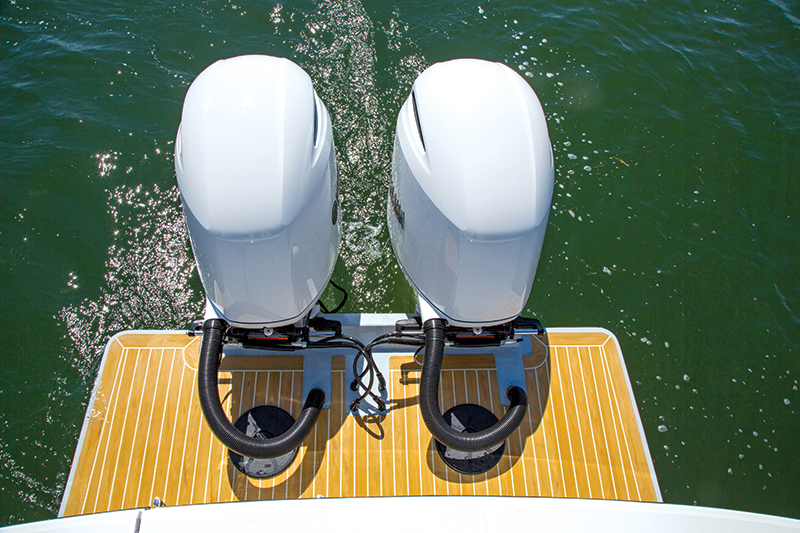 Those big powerplants don’t eat into the swim platform, either, because they’re mounted on brackets all the way aft, which extends the boat’s LOA to 30 feet, and a transom tuna door makes entry and exit easy, which is smart given all the room on the platform. Electronics enthusiasts will enjoy the option to have a Garmin 16 Fish Package factory installed (12 Fish Package is standard), including a GPSMap 7616 XSV 16-inch multitouch widescreen multifunction display, a Reactor steer-by-wire autopilot, an Airmar B150 CHIRP transducer and more. To keep the non-fishing part of the family happy, dayboating amenities have been added too. 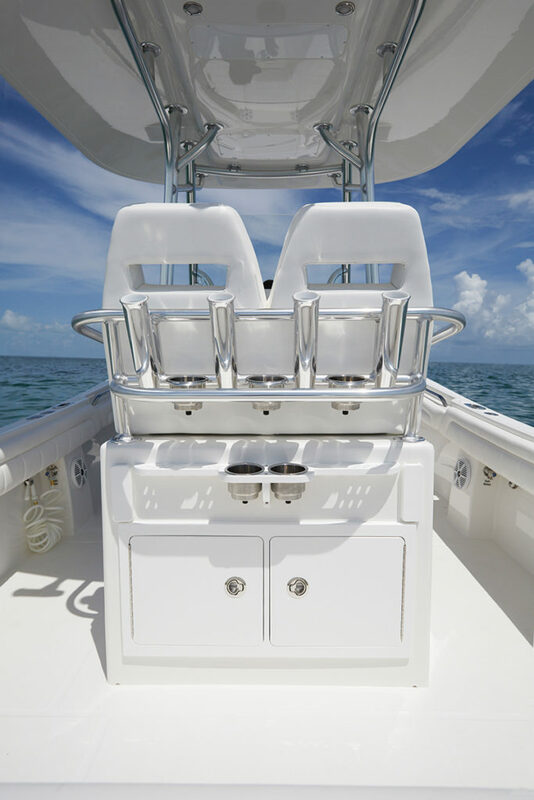 A standup head compartment is in the console, and buyers can add a forward sun shade to cover bow seating — room for six or seven people with their feet on the deck or two people stretched out lounge-style — and/ or a watersports tow bar, for when it’s time to play. 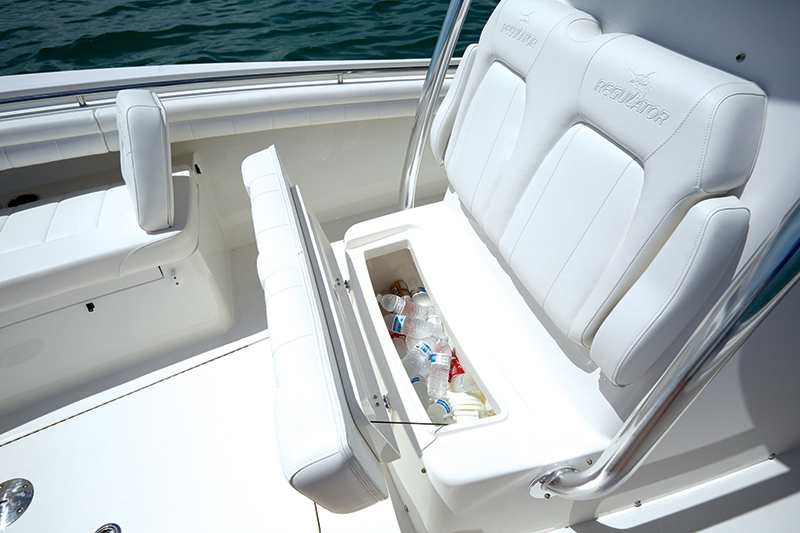 An integrated transom seat can accommodate two more passengers, and it folds flush when it’s time to fish.